The title refers to the encaustic and layering processes that serve as leitmotif unifying the works of Joan Giordano, Renee Magnanti, Nancy Azara and Kathy Stark. 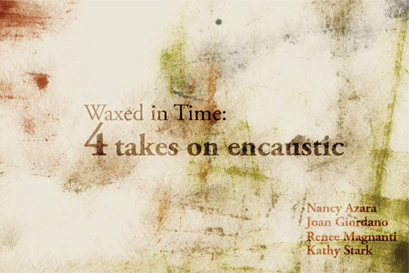 These four masters express their concepts in wax creating a dialogue on issues important to humanity in general, such as communication, trans-culturalism and trans-spirituality. In the sense that they're working with fire to create encaustics they can be seen as modern day shamans who instill spirit into their works of art. Each artist in the show uses encaustic in a different manner layering, burning, incorporating, manipulating it into unique essays that convey an individual aesthetic. Kathy Stark layers encaustic wax with other materials like paper, then scratches her scripts onto the surface after which she repeats the process that results in rich layers of communication. Stark deals with the interplay between language and divination loosely referencing the Nordic Runes, the Kabala, the Tarot, and other esoteric phrasing as a way of seeking answers to the universal questions of life. Stark like Pandora, embodies the female quality of curiosity and a thirst for knowledge that although in Patriarchal cultures is associated with negative meaning, is in essence, the life giving spark of humanity. Stark's work relates to Nancy Azara's whose artworks are also deal with the divine. Azara's ritualistic objects and altars are like manifestations of the spirit whose presence she feels while simultaneously methods with which to "touch the nature of the divine." Azara utilizes encaustic with gold leaf at times to reference the Hagiographic methodologies of Eastern Orthodoxy, but also ancient societies like the Incas who used gold as a ritualistic material. Like the Shamans of Paleolithic society Azara waxes her images in color and gold populating them with symbols like palm prints that served as artistic signatures. Renee Magnanti layers her panels and then carves them into patterns that are complex and varied in meaning and form. Her work for this show comprises two multiple piece installations that work individually. The first juxtaposes textile patterns from Chinese Qing and Ming Dynasties with Greek pottery motifs alongside other multi-cultural designs with a message about a common unifying bond. Her second installation is inspired by indigenous textiles which have patterns made by women reflecting the female's importance in these cultures as well as the importance of textiles in the social and life events of the society. Joan Giordano's statements are grand gestures into the human psyche's layered symbolism. Giordano folds international newspapers into her molten wax to produce forms that interplay with each other as well as trans-globally. Giordano’s work is part of a continuing series of sculptures that relate to the energies of nature and a deeply felt affinity for the delicate balance between the fragility of the human condition and the power of humanity.